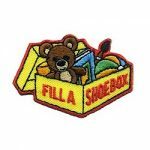 Fill a shoe box for children or the military at the holidays or any time to make someone smile. 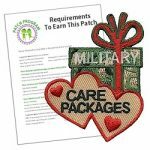 After your service project, give your girls this patch from MakingFriends®.com to remember their hard work. If your local service unit or council does not already provide information regarding flag laying at a local national cemetery, your troop can contact them to find out how to register and what you should bring. This patriotic service is performed by girls and many other organizations annually and is often followed by a very moving ceremony. Don’t forget that flag pick up the following weekend is just as important. 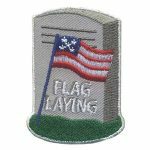 The Flag Laying patch is appropriate for girls of every level. 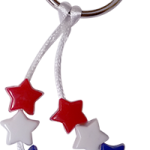 Your girls will appreciate your providing an opportunity to thank those getting ready to board or coming home from their Honor Flight. Scouts and many other groups gather when veteran’s make their trip to and from an Honor Flight trip to visit a war memorial. 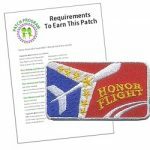 This patriotic patch is a special addition to any Scout uniform. Add your message to the inside if our top-quality cards. 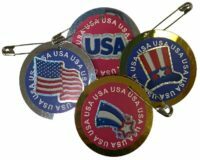 These make wonderful tray favors to send to the V.A. 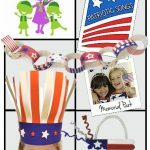 hospital or send as cards to our active military. 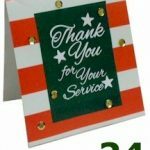 Kit features red and white striped cards with a green message to glue to the front and finish off with gold sequins. 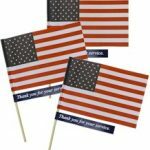 Your girls can march in the Memorial or Veteran’s Day parade with their flags and give them to Veterans along the parade route. 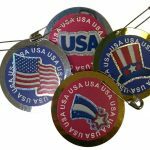 They can also be presented during trip to the VA hospital or sent in to use as tray favors.